.....Sadly there isn't ACTUALLY a Tooth Fairy Long Service Award, but if there was one, I'd win it. Damn right. Last night The Boy, aged 6, lost his first tooth to much excitement. But mostly his own because it appears that there IS a finite amount of times one can be genuinely excited by a tooth falling out of someone's head. And while he was strategically positioning his tissue-wrapped tooth under the pillow (for ease of Tooth Fairy access OBVIOUSLY), I realised I've been masquerading as The Tooth Fairy on a fairly regular basis for about 11 years .....so far. If there was an actual Tooth Fairy, she would have had me up for stealing her identity YEARS ago. I've already amassed, from the three girls, enough teeth to make a decent necklace and perhaps when The Boy has finished I might have enough for a bracelet too. Because what else do you do with children's teeth harvested from under pillows after midnight? You going to throw them in the bin? Are you? No, you're going to shove them in a box, in a drawer and pretend they're not there OR you're going to make a necklace. Maybe. Some time. "Oh bugger, where's the wrapping paper?" "Oh bugger, where's the scissors?" 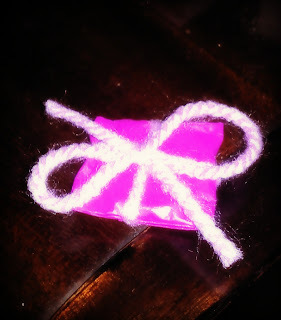 Eventually, at 12.49am, I shoved the shiniest pound coin (inflation being an entirely alien concept to Tooth Fairies) I could find, hastily wrapped in pink tissue paper and tied with purple wool, under The Boy's pillow with a brief prayer that his sisters wouldn't remark on how standards had dropped in Fairyland.